Many homeowners are adding a hardscape feature of a rock garden to their landscape design, not just because it gives an interesting physical variety to the landscape, but because it provides an opportunity for the development of one of our interesting groups of plants. Rock gardens showcase those plants which grow their best in a miniature landscape with rocky features. The most interesting group of plants for rock garden designs include the plants known as alpine plants. If you want to take your rock garden design to the next level, consider downloading free garden design software to visualize your own unique garden space. The rocky bank provides the most straightforward opportunity to design a rock garden. Some backyard landscapes boast a small brook or stream whose rocky sides can be transformed with carefully placed rock garden plants and foliage. To maintain the true rock garden character, it is essential that plants should be selected which are in harmony with the spirit of the garden. The idyllic location for a rock garden design is one where the foliage and plants are sheltered with snow during the winter and not exposed to extremely hot conditions in summer. The damp, cool rock crevices in a rock landscape design provide the best location for these conditions. The group of plants valuable for the development of rock garden work is comparatively little known to the amateur DIY gardener although many rock garden plants are repeatedly used for other purposes. It is true that many of the plants grown for rock gardens are very dwarf in their habit of growth and much more sensitive to changed conditions of soil and exposure, and that many of them therefore require knowledgeable labor for their natural development. Remember, any home gardener or professional landscaper with an iPhone or iPad is literally carrying a computer in their pocket. With this computer access, plus a landscaping app such as Dirr’s Tree and Shrub Finder, any DIY gardener can choose plants, trees and shrubs for their own unique rock garden design. Want to know the best dwarf trees to highlight your rock landscape design? No need to return to the house to search on your computer. The Dirr’s Tree and Shrub Finder app is centered on the favorite landscape gardening book, The Manual of Woody Landscape Plants. 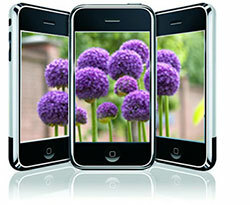 Dirr's landscaping software encompasses 1670 species and 7800 cultivars, with 7600 high-quality plant images. The plant database software is searchable by 72 criteria, including hardiness zones, water and light requirements, growth characteristics, flowers, fruits, and fall colors. The most current and dependable material on woody landscape plants for the landscape professional and the home gardener alike make up the best landscape app. The size and scope of rock garden design landscaping required will vary according to what features your home landscape presents. Some backyard landscapes boast a small brook or stream whose rocky sides can be transformed with carefully placed rock garden plants and foliage. 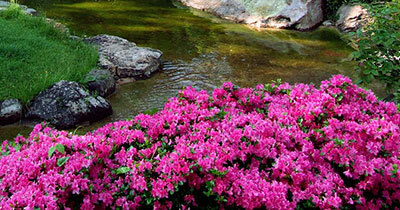 Another home landscape could feature a rocky bank on a hill or slope to support a quickly constructed rock garden. The rocky bank provides the most straightforward opportunity to design a rock garden. To begin, use a wedge to open up some of the cracks between rocks to expand the opening for plants. Next, fill the opening with rich fertile top soil. It is advisable to have these crevices open into areas of soil to expand the planting areas. This is not possible on natural rock banks; in this environment. With these natural rock gardens, you can only find the depth of the soil in the crevice through trial and error. In establishing a brook or stream rock garden, boulders and rocks will typically be a natural feature of the landscape. The challenge with this rock garden design is to arrange the rocks in an unstructured design and with soil between them. Factor in the increase of water during rainy seasons by confining rock garden designs and layouts to the spaces above the flood areas and perhaps plant a few annuals near the water. Do not apply too much effort positioning the rocks artfully in the basin of the stream because the water is capricious and will no doubt destroy all your efforts. If you want to take your rock garden design to the next level, consider downloading free garden design software to visualize your own unique garden space. 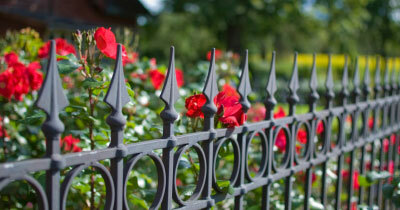 Save time by utilizing landscape software for planning a rock garden bed or backyard landscape. It is easy to choose plants, foliage and shrubs all on your computer. Choosing from a list of rock garden evergreens and plants that are extremely dwarf in character and not vigorous in their habit of growth is the first step in creating a rock garden feature. The most interesting group of plants for rock garden designs include the plants known as alpine plants, which are low-growing, very dense, and compact in their habit of growth. Most of these plants have small leaves and the flowers are rather brilliant and marked in their colors. The term alpine plants is applied in its general use to that dwarf and low-growing group of plants which have a tendency to compactness of habit, and which in their mature form of development seem to fit into the confined atmosphere of the average rock garden. Although true rock garden plants are the alpine types, for rock garden purposes today, landscape architects include not only the alpine types but many other small plants from the lowlands, from the woods, or from the more arid desert sections. There are a few of the tall-growing types of plants, such as foxgloves and some of the single roses, which, though not dwarf in character, are admirably fitted to the scale of rock garden work. Foxgloves are easily raised from seed and bloom the second year after planting. Foxgloves are effective in any rock garden, and especially when seen in bold groups with a background of dark foliage. These plants are best located away from scarlet flowers, as their tall spikes of purplish pink blossoms do not harmonize well with red. Not every plant which is dwarf in its habit of growth is desirable for rock garden designs. Many of these dwarf plants are extremely undesirable, such as the creeping Jenny (lysimachia) and dead nettle (lamium maculatum), mostly because of their tendency to grow rampant and to crowd out and smother many of the more sensitive and more beautiful types of rock garden plants. 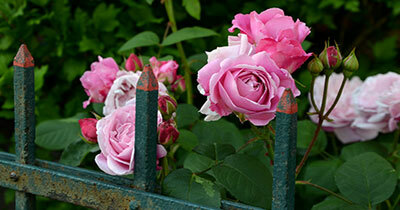 These plants are also difficult to eradicate from the garden once they become established. They should never be used except in a rock garden on an extensive scale where the tendency to spread will not eventually become invasive. In order to maintain the true rock garden character it is essential that plants should be selected which are in harmony with the spirit of the garden. 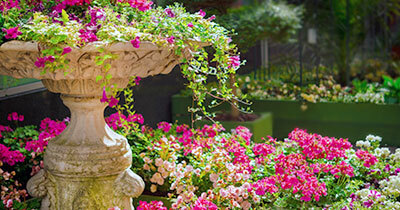 Many so-called rock gardens are filled with the more common annuals — sweet williams, phlox, hollyhocks, and even large irises — plants which belong to an entirely different type of garden, or which, because of their size, are not in keeping with the scale of a minutely detailed rock garden. One of the most successful ways for obtaining good rock garden plants is to grow them from seed. It is often easier to seed plants in rock garden groups and crevices than it is to plant nursery-grown stock. It is not necessary in the development of an appealing rock garden design to use a large quantity of different types of plants. The success of a rock garden is dependent largely upon the ability of the designer to select proper types of plants for a specific purpose, whether the rock garden be very small and occupying only a corner of the lawn, or whether it be an extensive area in some wooded portion of the property. Such plants as hydrangeas, spireas, petunias, and many plants of these types which the gardener has often seen in rock garden work, give evidence immediately of the lack of knowledge of plants and of their proper usage. It is true also that the plants which are used in rock gardens require an amount of care in their maintenance equal to that given plants in the more refined and formal types of garden work.